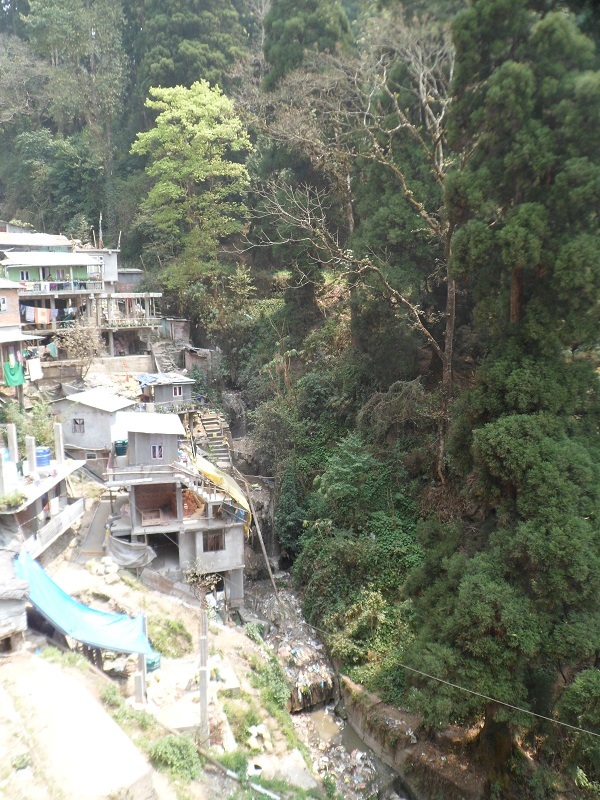 Now in our second week of the project, we are beginning to get a bit more settled, we are getting to know our way around the steep sloped roads and little step shortcuts that make up our journey, down to the towns markets, cafes and restaurants and of course to the Edith Wilkins Street Children Trust building. 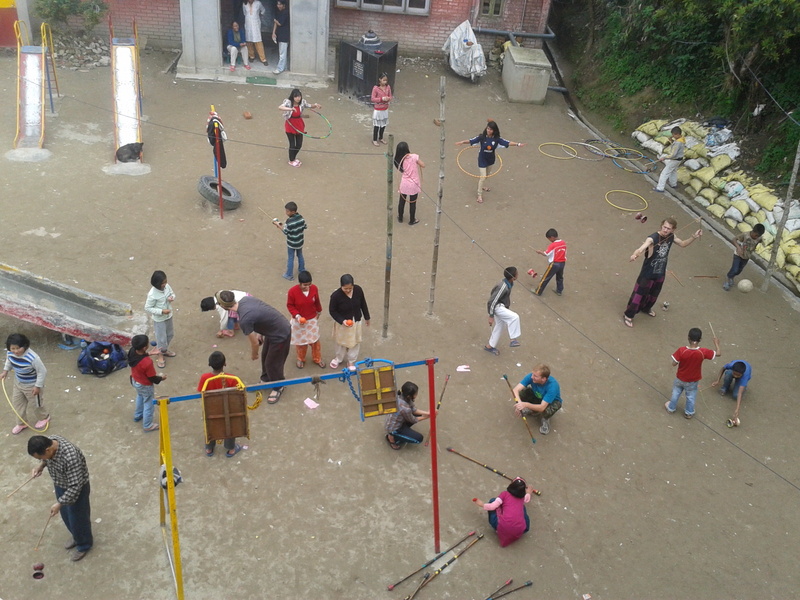 I think this second week is one of the best times for the project, we have got to know the kids better and even mastered a few names, the kid who I could only remember as colander in week one, I now know by his real name, I think. Anke knows nearly everyone’s name now which I think is incredible. This week has been all about learning and playing, we have had time to introduce each prop and skill. The public show is not yet occupying our minds and everyone is just having a go and finding their place! As a team we have been working together now for 4 months and things are running smoother than ever, our meetings are precise and to the point, we know what each of us is capable of and can set up a curriculum in no time, we are getting sensitive to each other’s needs and we know when to give a little space, like we know when to take some. We have got to know each other quite well, we have become like a little family of circus folk. They all sing along, so many smiles, I can see what tight bonds there are here. This lot really are like family to each other, it’s a beautiful moment. Lunch time comes and so does the rain, it comes hard and with lightning and hail – an epic storm. It lasts all of the afternoon, the rest of the event is cancelled, and all the kids return to the rooms and we are stranded inside for the afternoon, thankfully we have all the toys to play with. The sessions in the week are a much different story to the weekend, more than half the amount of kids and there is the music and games teacher around to help keep order and translate. We form circles and make fun for all, communicating using the universal language of movement, sound and expression. We lead funny warm-ups, act a bit silly and play games; we set an example that it’s ok to be yourself! The kids start showing us who they really are, their characters are coming out! Paul leads to grove armada, Anke to gangman style, Andy is a child again, Chez has a way of facilitating us through a world of magic hidden just under the level of the ordinary and mundane. I play a game, it’s a test of skill and wit where the smallest may win over the tallest and the weakest over the strongest (it’s just knocking a flower stick off the opponents head, but it’s so much more). Paul leads a game of ‘Marco Polo’ while everyone has a turn there is lots of laughter. Abi’s got all the hoops out but they are not just hoops, they are islands and we need to work together to stop an intruder talking one! We have sessions in Poi, flower stick, contact juggling, hoop, diablo, staff, ribbon, dance, hip-hop dance, beatboxing/singing, theatre, yo-yo, acro, unycicle, slack line, rola-bola. So many sessions and so many conga lines of excited kids going between sessions. We are running a tight ship, mostly. Highlights for me include teaching slack line (they are so determined to get it), passing a diablo with Susmita (she’s pretty good at it but I kept dropping it), making and teaching a PWB rap beatbox song with Chez and leading a hip-hop dance class with Paul, making some shapes and jamming! A moment that stood out for us was seeing Sapna , who is one of the quiet and shy girls, Shine! She was showing some dance she learnt from Anke, for a moment she was transformed and appeared more confident after. Brilliant! It’s about showing kids that they can do it, whatever it is, they just need to want to do it and then focus, practice and they will prove to themselves that they are capable and once they know that, they will know they are capable of more!! We eat lunch with the kids, nice dal n rice, there is always a prayer before, and I can’t understand it except for one word “Danyebad” which means thank you. This trip has been such a journey I have seen some in India who don’t get enough food, don’t have cloths or a roof over their heads. So I appreciate what I have now, much more and give thanks, and give thanks to be free to choose what I’m doing in life and thanks to all the wonderful friends and family who support me to do it! I’m noticing lots of duality, differences and contrast. Here the weather can change in an instant, it rains lots but we have to ration our water as there is a shortage. The wealth gap is so blatant I often see people looking through rubbish, and men breaking their backs carrying goods, furniture and even fridges up and down the hills, while there is no shortage of luxury hotels and decadent outlets to spend big money on well dressed tat! In our group we are such different people all with different ways of looking at things, doing things, it can be hard, but ultimately it helps us be diverse and capable of more, variety is the spice of life. We get told on Friday, that the next day all the kids are going down the hill to another school to take part in a sports day. We are asked to do a show. The next day comes and there is a torrential downpour as we are contemplating going, text messages are sent back and forth, is it raining down there? Is it outdoors? Is it still happening? We are dubious after the foundation day washout. It’s indoors, they send a taxi, off we go! We are greeted be Naverata, Cath and the music teacher, the space is a big upstairs halls with a flooded sand yard outside, there are kids hanging over the balcony with looks of anticipation on their faces! We enter the hall, it’s massive with chandeliers hanging from the ceiling and sports tracking painted on the floor, SPACE! We get to warming up, hooping and joggling up and down. Faces watching, there is a stage at one end with a couple of rows of seats. They also have a fairly nice P.A system; I get excited about beatboxing through it! We need a little group talk to form a plan; we are one down because Livvy is ill. Ok big space, let’s play it a bit different. We are ushered onto the stage and I’m invited to sit down next to a well-dressed man in a Napoli hat, he introduces himself to me as Chairman of the Darjeeling Municipality, there are other councillors and heads of NGOs sitting with us, all the kids are outside on the balcony , there are about 30 people sat around the edge of the hall and a man is giving a speech, I can’t understand, then another speaker and another, is this a sports day or political conference? A though dawns on me, what if they ask me to speak? Anything can and does happen in India. The thought turns to reality, I’m down in the middle of the hall holding the microphone giving a speech, talking about the weather, saying what a good job EWSTC does, introducing us and singing a big happy birthday to Paul! ( ITS HIS BIRTHDAY, he is the only one of us to have a birthday on the tour) The show begins, I’m beatboxing the tetris song as the birthday boy is getting technical with his yo-yo. We do poi, hoops, juggling, diablo, dance we play we enjoy the space and we improvise, we have a whole umbrella act, twirling spinning and it’s so much fun we forget it’s a show we are just in our element. After our show the sports day got into full swing lots of classic games, sack races, egg and spoon type jobs and football!! We cheer on our team COME ON EWSCT!! It’s a very surreal experience, even after so long out here I still find it odd being here! One clear morning shows us the jagged cliffs off the HimalayanMountains, reminding us of the bigger picture of our surroundings. Talk is on plans and ideas for after the tour, reminding us of the bigger picture of our lives back home. It feels like the end of the project is looming, but it is not over yet! We agree we should be making the most of the time we have left here; we still have more performances and lots to teach the kids before their big performance at Chowrasta! As we rise from the heat and chaos of the north Indian lowlands our three-hour jeep ride gives us 2300m increase in altitude. 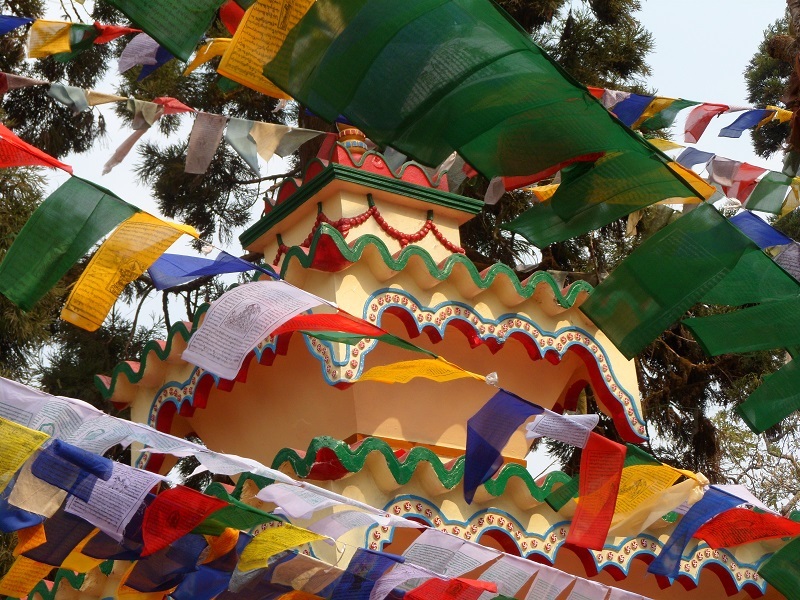 As the landscape around us is morphed and contorted by forces continental in size, likewise the faces of the locals widen into more oriental and Tibetan smiles. 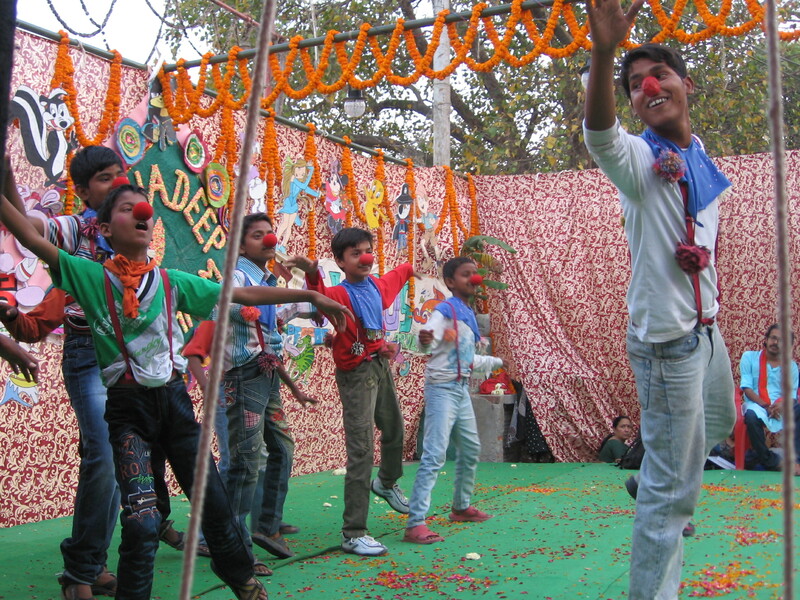 Our first visit to the Edith Wilkins Street Children Foundation centre was very inspiring, a very well organised affair And although the nature of this project is a little more serious than others (some of the children here are having problems at home while others may have been rescued from child trafficking operations) we have never had a more giggly audience for our debut show, and Indeed in our first workshops I was impressed at how much more attentive and excited these kids are to learn what we have to teach. 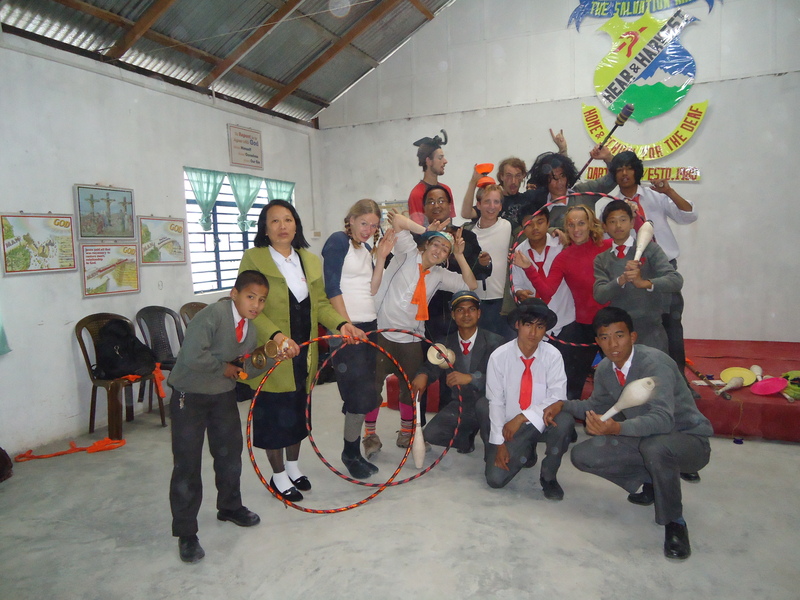 Before we performed our show for them we were treated to one from the children themselves. This being the 3rd year PWB has come they are already showing some considerable skill in various toys as demonstrated in a well thought out and choreographed performance showcasing diabolo, hula-hoop, ribbons and spinning plates. And ever since our show I have had no shortage of children eager to know when we will be bringing out the Yo-Yos (our new toy for this year). 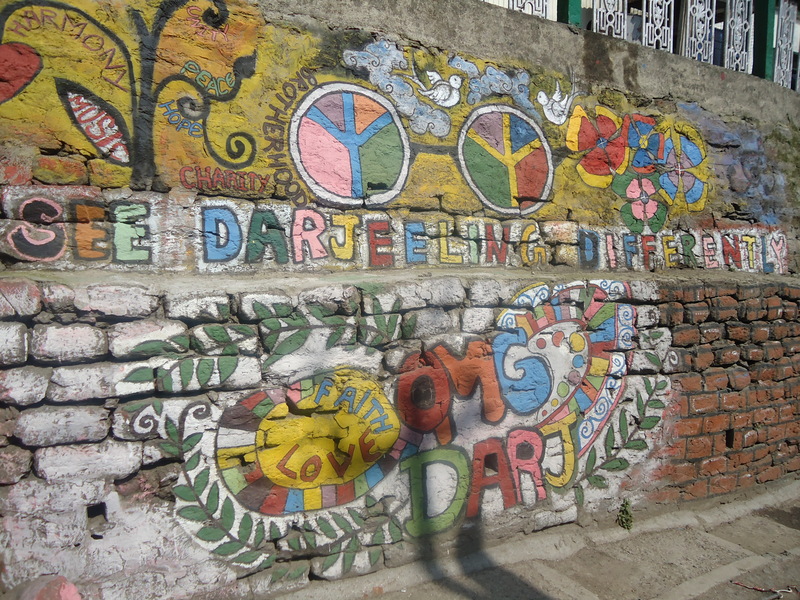 Since arriving in Darjeeling we have all noticed a shift in the atmosphere and emotions of ourselves and our surroundings. Mountains Humble people; in the other cities we have visited the people are all you see, they become the focus of the population’s attention whereas here we are reminded of things much bigger than ourselves. This is the main reason I think for the peaceful and eclectic mix of faiths present here. 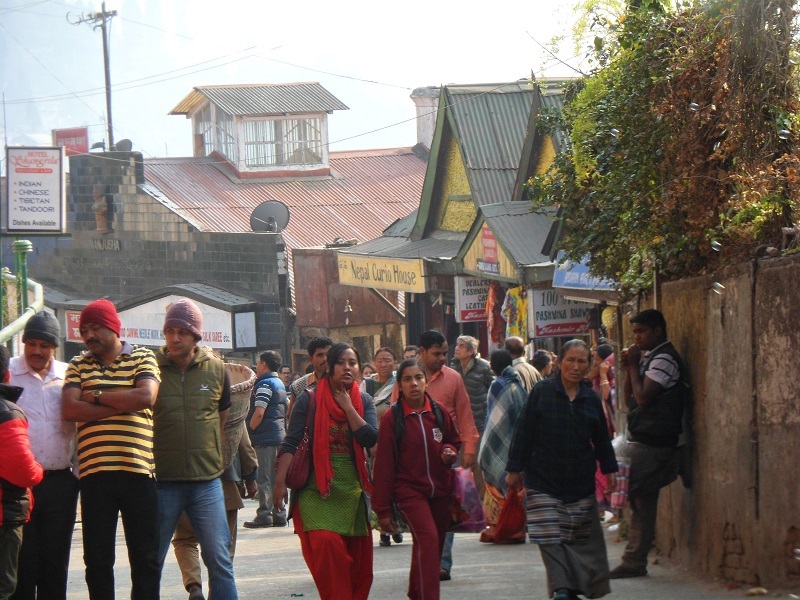 Although technically part of India this place is unmistakably Nepali; a blend of Hinduism and various forms of Buddhism coexisting alongside jeeps proclaiming that ‘Jesus saves’ as well as those extolling the owner’s following of clans such as ‘Chelsea’ and ‘Manchester United’. The natural beauty of this place has had an impact on us all, with more team members showing interest in rising early and exploring meditation practice. This induced calm (aided by the slightly more English climate) manifests into a feeling of familiarity & homeliness among the group, we huddle around heaters for warmth with many of us influenced by the native textile trade and the sudden need for woolly warm clothing now thoroughly addicted to crochet and knitting as a more sedate creative outlet. 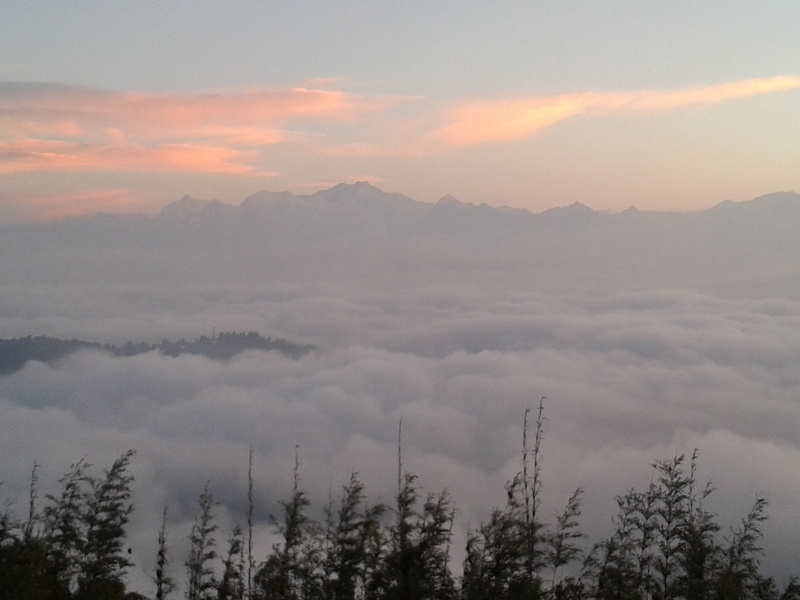 We are awed frequently by thunderstorms and rare glimpses of the Himalayan giants in the distance. Whether struggling up a 45 degree incline after just popping to the corner shop, or being awed by the scenery we are reminded of geologic forces of greater size and timescale than we can ever truly relate to. They remind us of our fleeting existence as a thin scattering of organic life on the surface of this ever changing ball of rock. Squidged inbetween the bottom step of Assi Ghat, the Holy river Mother Ganga, the huge bonfire pile for Holi Play the next day, the dogs, the Puja, the Sadhus, the tourists, the chai stalls, and the candle selling children, there was a full-on stage for the Asha Deep Vidyashram’s annual performance. 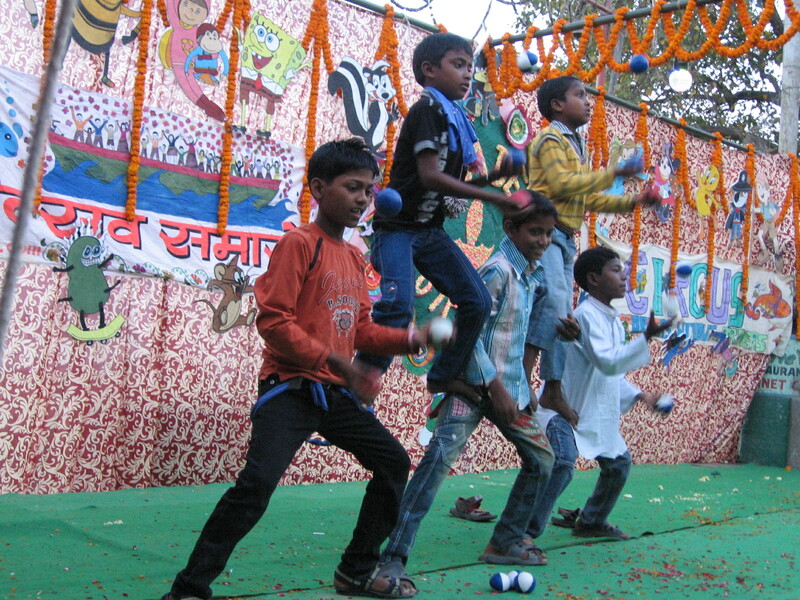 Until about 10 years ago it was taboo for the community of Nagwa to come into the Ghat area because of their lower caste, so the school performing here every year is a huge progression and a big thing for everyone involved! There was flashing lights and a huge sound system! Whirring with technology, the beauty of the billowing curtains anchors the space and reminds us we are doing an outdoor show open to the elements of the world. Abi, Andy, Anke, Carlos, Chez (me), Livi, Paul and Simon; we scrape together our cleanest and smartest clothes, splash on the glitter and excitedly make our way down to Assi Ghat. The bamboo structured stage totally changes the space, it all suddenly feels very official, professional and proper. Armed with our bags of props and costumes the children run and greet us. There is a joyous and exciting atmosphere that whips us up ready for the show. In true Indian style the show lasts FIVE HOURS!! Has two breaks for Puja, which is the daily prayer ritual for the Goddess Ganges and despite the booming music continues as normal. A surreal and dreamlike evening. Full on traditional Khatak dance, Bollywood inspired dance, singing, poetry, jokes, a theatre play about gender roles (there is a big emphasis on this issue all over India at the moment), and of course the PWB magic filled acts. I genuinely couldn’t have felt prouder of all the hard work from the young people involved and the PWB team energy to create the variety of acts. As PWB has worked with this school for four years before, the skill level is very high; we found this very stimulating as we discovered ways to respond to their unique skills. A vast mix of ideas culminated in some energy filled moments, some poetic movement, some crazy images and loads of smiles! During the show there was definitely some tingly arm hair as we see the kids fully embracing what we have spent weeks developing and rehearsing. They all go for it! Anke’s Ribbon dancing girls smiled so wide as they moved around the stage and the big group dance was full power – they owned that space with their strong attitude! Interspersed with the dance was Andy’s adorable Spinning Plate children and those children who Paul had worked with to develop ninja Yo-Yo moves. Simon’s juggling boys were so sweet with their concentration faces, they had some slick tricks too. Simon also worked with some boys to create a Hip-Hop-coolio dance to a live beatbox soundtrack. They can seriously move!! Andy’s Diablo act was amazing to watch! All over the stage, jumping on and off the front – everyone was having so much fun, the music was banging and the strobe light was vibrantly intense. Livi’s hula hoop act was so well choreographed, it was so visual (especially after the late night sparkly hoop taping) and empowered the girls big time! I worked with a group of boys using flower sticks, (a prop I know very little about), it was great to approach it differently. They wanted to be horses, bikes, rowers and diggers, so together we choreographed a very sweet little number to Spike Milligan’s Ning Nang Nong. Dressed up in sashes and wooly dicky bow ties they were very playful with the music and really came out of themselves in front of the audience. I also worked with a group to make a clowning number so as to give them the opportunity to perform without hiding behind a prop. Having spend hours making papier-mache red noses and pom-poms for neck ruffs they look great and have a really beautiful time with the music and following their instincts. Once they are on the stage it reminds us as facilitators we have done our job, and now they enjoy the moment with the watching eyes of the audience. Then came the long awaited fire show that Abi, Carlos, Paul, Andy and Livi worked really hard with individuals to develop their technique and confidence. Some performed for the first time with fire, bringing that elemental raw energy that spinning fire does. Some more experienced fire spinners shone like fireflies as the hundreds of people watching from the ghat applauded and cheered as they were impressed and mesmerised by the patterns. One young girl overcame a big issue of performing with fire staff, the boys didn’t want her to perform with them, the girls were jealous that she had practiced this prop. Despite all this, she did an amazing show and we were all totally proud of her standing up for what she wanted! Girl power! THIS SHOW WAS EPIC! Coming in as a Theatre Practitioner has been very interesting for me. There is burning question in me of how can you use the circus skill to say something or do something more than demonstrating skill? In this context of Asha Deep the beginnings of this enquiry have begun to be explored. 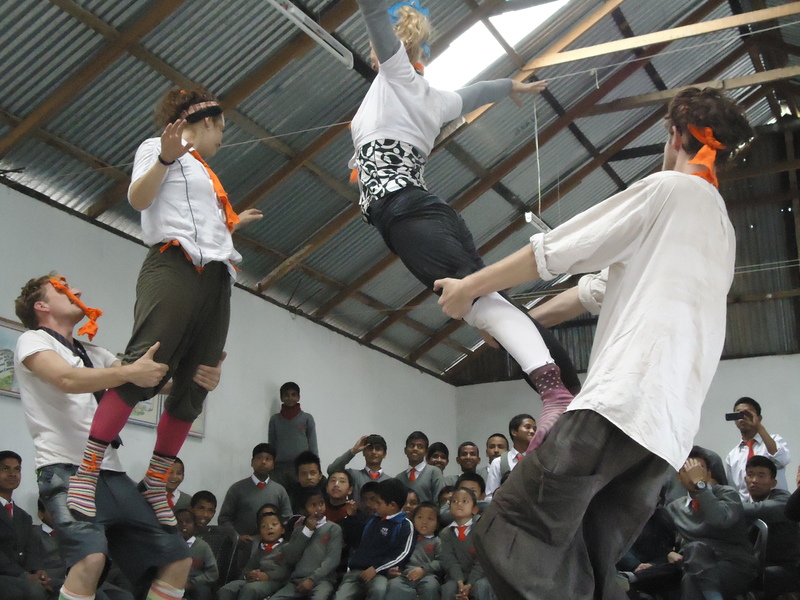 Developing performing skills to complement the trick based skill supports the participants to grow in confidence and self esteem even more. With this project it would be great to continue to support them in developing this strand of performance work. 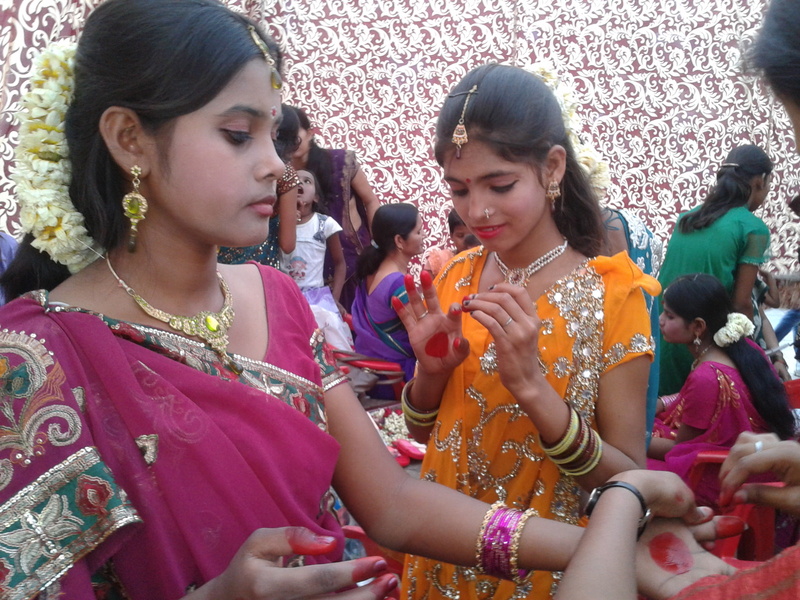 It was a lovely round circle once again with this second project in Varanasi as we performed our PWB show for the last time, this time in the Nagwa district. All the kids that we have built relationships with were around helping us set up and getting more of their friends from the area to come form our audience outside the local Mosque. 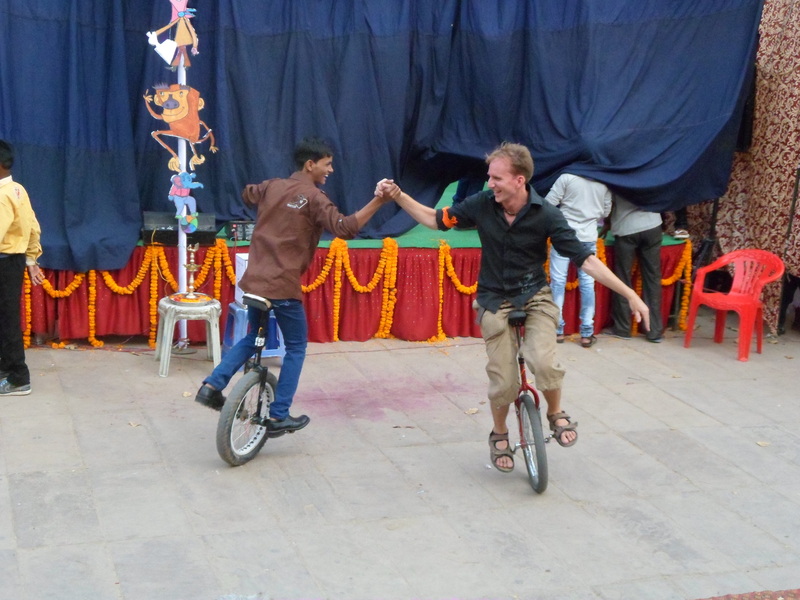 It felt very special performing to the smiling faces we have got to know, and to see the intrigue from passer bys who cycle over to watch the show – biketastic Nagwa! As the sky darkens we enter the last phase of the show and prepare the fire props. 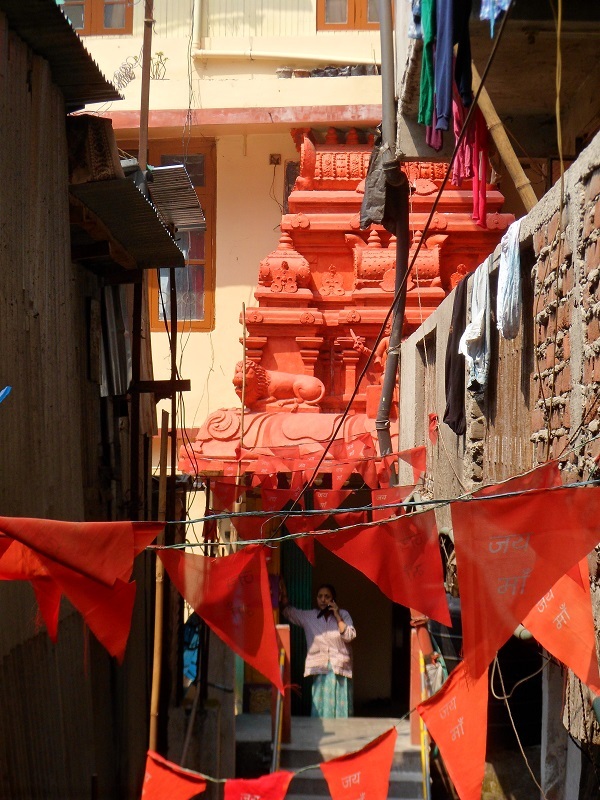 This was possibly the most spectacular moment in Varanasi for me. The sky flicked with lightning in the distance as two of the older lads, Manish and Gopal, spin their duo poi in incredible timing with the music and each other. Feeling the brewing of an ending, we finished the show and said goodbye to the children. As we began cycling home laden down with all the show kit on, in and around the bikes, the biggest storm hit the area, the rain pummelled down, the lightning forked and sheeted, creating an intense and charged energy. In between the buffalo, the cows, the motorbikes, the chai shops, the material stalls, the hiding dogs, the beeping scooters, the honking cycle rickshaws, the puddles, the ditch and the sky we exist with a mixture of nostalgia and the pure enigmatic joys of living! 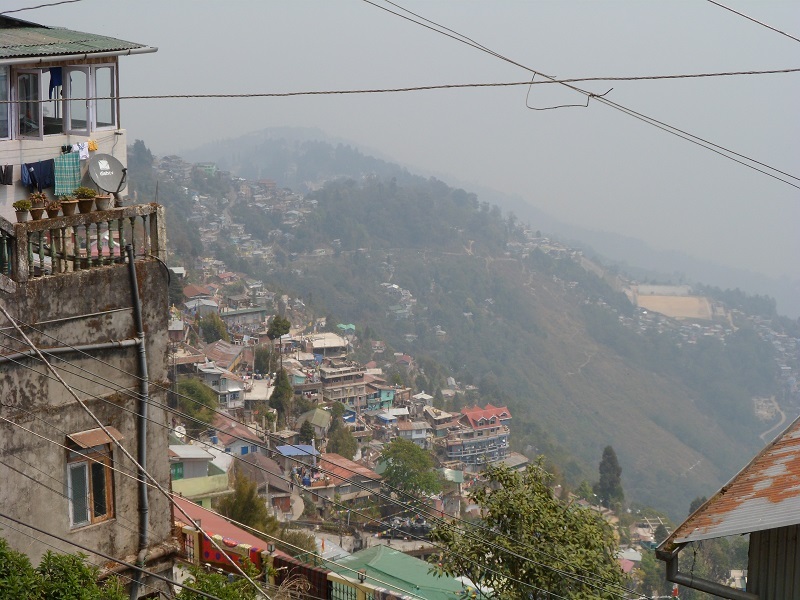 Onwards up the mountains we rise, to continue our circus adventure to Darjeeling. 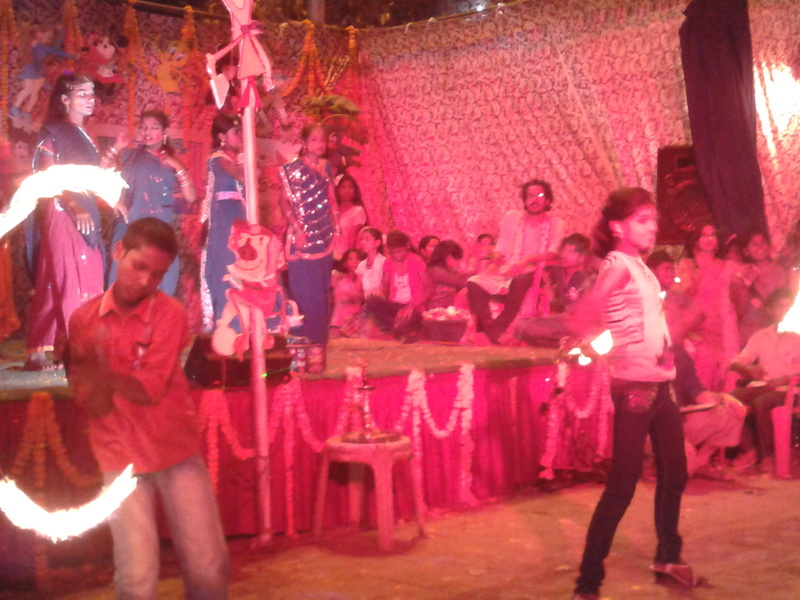 Up, up, up, up, up, up and away…..
Jaya in the Fire show on Assi Ghat!! 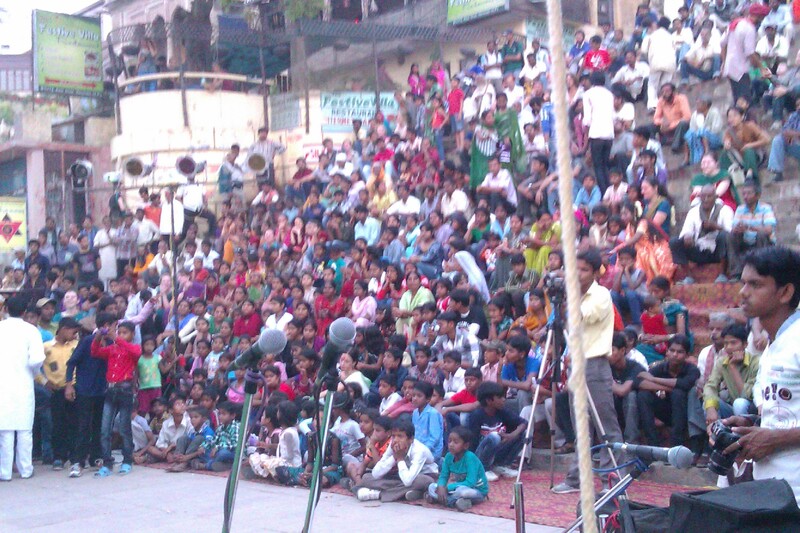 The crowd watching the show on Assi Ghat!! The talented Juggler Act, Directed by Simon Abel. Pre-show entertainment to warm up the crowd. The gorgeous smile of Veejay! 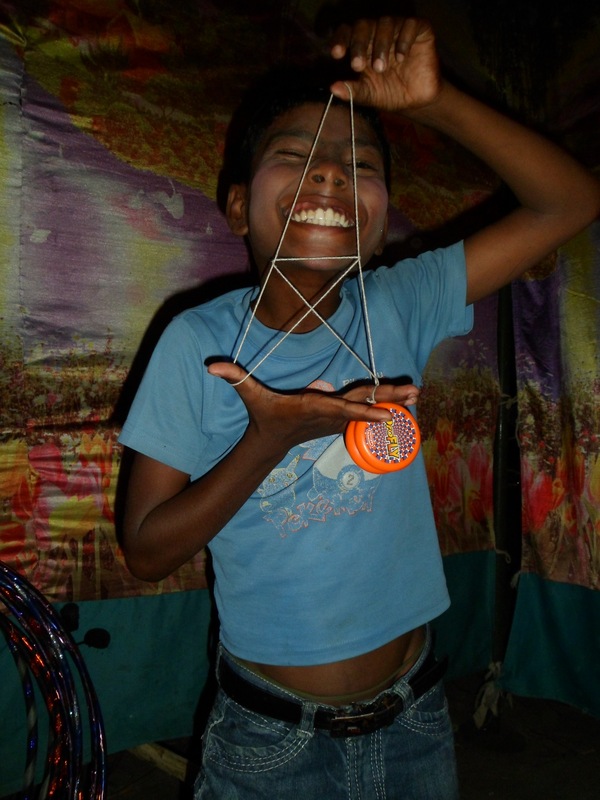 He was in Yo-Yos, Flower sticks and Juggling – TALENT!! You are currently browsing the archives for the India 2013 category.